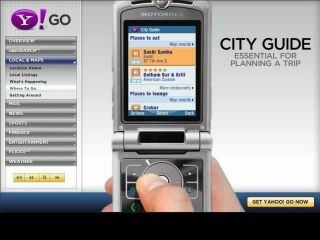 Mobile phone users surfing the mobile internet with Yahoo's oneSearch service will be able to get full web pages displayed on their regular mobile phone. Yahoo is to adopt a clever web transformation platform - similar to the one Vodafone is using for its new Vodafone Mobile Internet service - that's been developed by Novarra . The Novarra server-based platform optimises web pages for mobile phones so you get a rich web experience when viewing regular web pages. You can get a full thumbnail of original web pages and zoom into the particular part you're after, or have the page rendered for a small mobile screen. What's more, the Novarra web transformation technology will work on practically any handset, mass-market or high-end. So there's no need to download additional software add-ons (unlike other web to mobile optimisation services). Full web pages are adapted automatically for the appropriate handset and browser type being used. And pages already optimised for mobiles can be delivered as intended. Because the technology happens at the server end, you get pages back reformatted with no noticeable delay on 2.5G or 3G. And the optimisation process reduces the data size of the web page sent to the phone, making it more economical for phone users not on an all-you-can-eat flat rate data tariff. As well as currently offering web page optimisation with images, Novarra has told Tech.co.uk that it's planning to introduce flash support to its mobile internet transformation platform. This will come into play in the next release of the platform in September.